Schweiz. ganz natuerlich. eBiker Paar unterwegs beim Combe des Amburnex. If you’re like us and have dreamt of a visit to the lush and verdant Jurassic Park sans dinosaurs, then you’ll like the idea of what we’ve dubbed, the Jura-Swiss Park. The route passes through six Regional Nature parks from east to west. 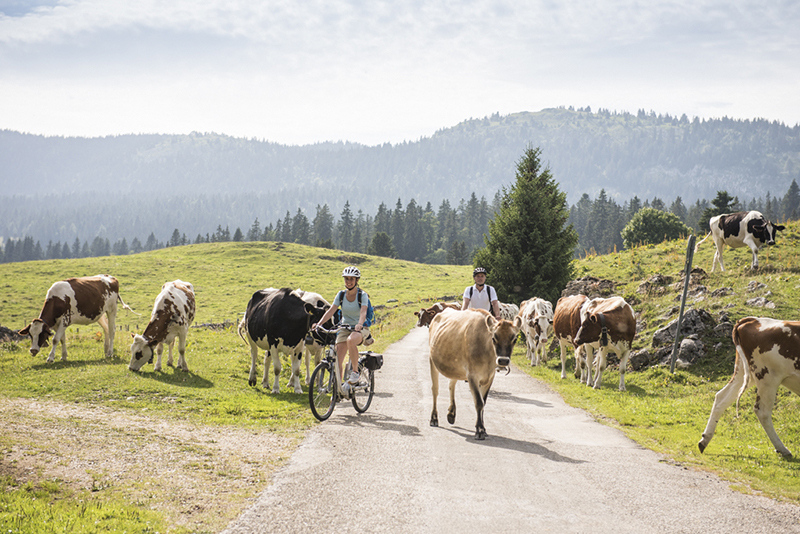 While very much less jungle-like and definitely no spine-chilling roars, the Jura nature park is all about rolling hills, pine forests, vineyards and a host of hard-working local farmers and wine growers. And best of all, the velvety greenscape stretches as far as your eyes can see. The best way to explore this vast nature park is on a bicycle. La Route Verte is one of the best routes to take, where you’d start in Schaffhausen and go through all of the six different nature parks in the Jura, including Aargau, Thal, Chasseral, Doubs and Vaudois, before heading to Geneva. There are seven stages of the new Route Verte from east to west following the gentle arc of the Jura mountain range. Along the way, you’ll discover virtually unheard of places and meet the life of the park – the delightful locals and their animals. 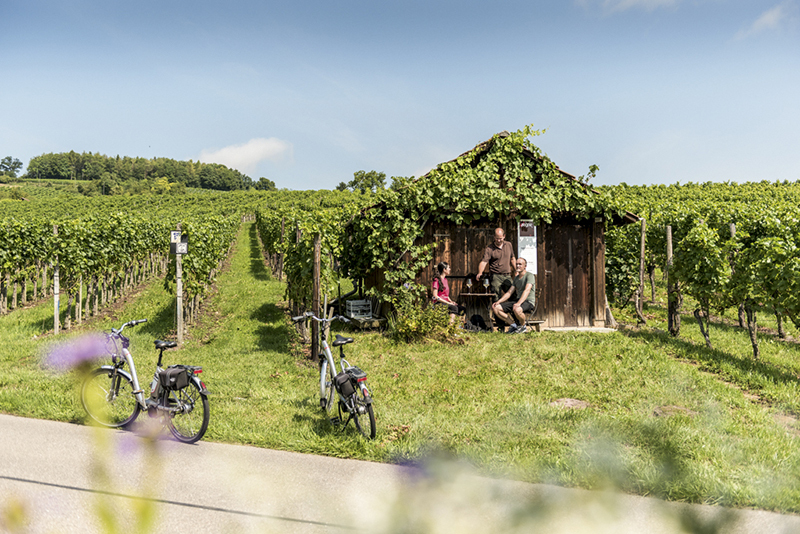 The wineries in Hallau in the Schaffhausen Nature Park will no doubt put a smile on your face. 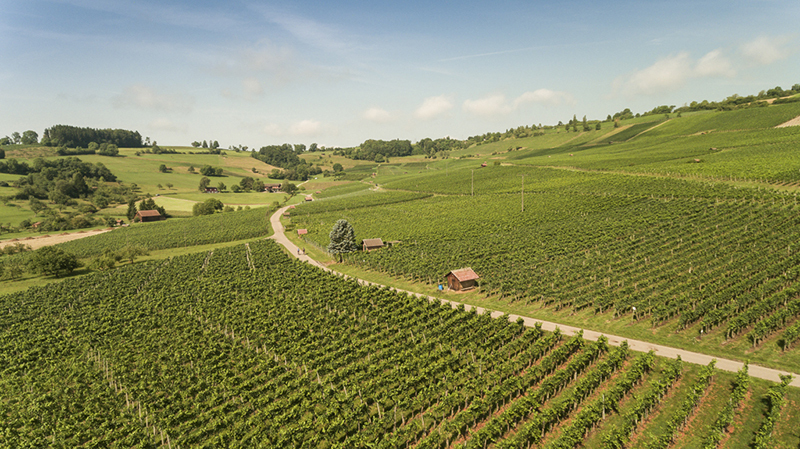 Here, in the largest contiguous vineyard in the German-speaking part of Switzerland, around 200 winegrowers produce approximately half the wine made in the Schaffhausen Pinot Noir region. Like most Swiss wines, they aren’t exported due to the limited quantity produced, so be sure you make time to go on a little wine tour and taste the local drops! Then in Doubs Nature Park, you’ll find the medieval town of St-Ursanne and the enchanting Franches-Montagnes, home of the Franches-Montagnes horses, the only horse breed originally from Switzerland. On the way to the Jura Vaudois Nature Park, you’ll go through the Chasseral Nature Park, past drystone walls and the UNESCO World Heritage city of La Chaux-de-Fonds, before going through the idyllic and picturesque Val de Travers, famous for its absinthe and its asphalt mines. Side note – during the journey, you’ll not only want to stay sober enough to cycle and enjoy the landscape, but be sure your cameras are charged as you will no doubt be constantly trigger happy! If you’re a music enthusiast and especially love guitars, then you will want to spend a bit of extra time in the buzzing village of Le Brassus. Home to the famous JMC Lutherie, Céline Renaud and Jeanmichel Capt, it is here that the pair have been making guitars and loudspeakers out of 350-year-old tonewood spruces from the nearby Risoud Forest for more than 12 years now. The final stage of the Route is between Le Sentier and the Combe des Amburnex, the highest point sitting at 1,351m asl. On the way down to Geneva, you will also enjoy glimpses of the glittery Lake Geneva in the distance behind some pine trees. And that would mark the near end to your adventure discovering the treasures of the Jura region.